ODESSA--Odessa-Montour's varsity volleyball team topped Watkins Glen, Thursday, Aug. 30. The final scores were 10-25, 25-20, 25-19, 22-25, 26-24. Hannah Chapman had 10 service points, nine aces and two kills. Jacy Knapp and JoLynn Minnier each had eight service points and three aces. The Odessa-Montour girls varsity soccer team fell to Canisteo-Greenwood in the championship game of the Campbell-Savona tournament, Friday, Aug. 31. The final score was 1-0. Odessa advanced to the championship by beating C-S in the opening game. ODESSA--The Watkins Glen varsity volleyball team fell to Odessa-Montour, 3-2, Thursday, Aug. 30. Katie Losey had nine aces, three kills, and 12 service points. Adrienna Solomon added seven aces, one assist, one kill, and 10 service points. Mattie Yontz posted six aces, 18 assists, one kill and 15 service points. Olivia Stephani earned one assist, one kill, and two service points. Ali LaMoreaux posted 11 service points. The Senecas lost to Thomas A. Edison, 25-16, 25-10, 25-13, in an away game, Tuesday, Aug. 28. Losey posted one assist, five kills, and four service points. Kelsey Kernan had two aces, one assist, one kill, one block, and seven service points. Yontz added 16 assists and Kelsey DeMillo earned five assists. Carlie Baker had two kills and two blocks, while LaMoreaux had one ace and four service points. The Seneca Indians' 2018 football season started with a win on the road, Friday, Aug. 31. The combined Watkins Glen/Odessa-Montour team beat Groton, 56-8. The Seneca Indians offense was led by Joe Chedzoy who rushed for 328 yards on 17 carries, with six touchdowns. Coach Trevor Holland said the offensive line helped all the running backs accumulate 546 yards on 49 plays for the night. The defense held Groton to 129 yards of total offense. Gage Arcangeli led the Seneca Indians with nine tackles on defense. The Watkins/Odessa team plays next against Susquehanna Valley on the Charles Martin Field in Odessa, Saturday, Sept. 8. Kickoff is 7 p.m.
Watkins' boys varsity cross country team placed fourth at Houghton College's invitational, Friday, Aug. 31. Gabe Planty led individually, placing second (13:01.2) overall. Max Evans took 12th (14:14.4), while Steven Gublo was 29th (15:27.6). Benjamin Swinnerton finished 34th (16:05.1). Elliott Holland was 38th (16:46.7). The girls also competed, but without a full team. Breanna Carl was 18th (17:29.8). Kai Sutterby placed 24th (17:58.6), followed by Makenzie Kellog in 34th (18:57.4). The Watkins Glen girls varsity soccer team beat Newfield, 8-1, at an away game, Friday, Aug. 31. Hannah Morse scored five goals, with two assists. Taylor Kelly also earned two goals, while Aislinn Klemann earned one goal. Danielle Leszyk had one assist. In goal, the Senecas' Cierra Barber posted seven saves. Watkins had four corner kicks overall. PENN YAN--The Penn Yan varsity football team opened the 2018 season with a 34-28 win against Waterloo, Friday, Aug. 31. Will Rogers rushed 116 yards over 14 carries, with a touchdown. Conner Fingar had 66 yards over three carries, with a touchdown, while Mekhi Mahan added 24 yards with three carries. Fingar also posted a touchdown reception, on 16 catches for 134 yards. Kyle Berna earned 72 yards over four receptions, with a touchdown. Mahan had a touchdown reception with five yards. Rogers was 25-for-36 passing, earning three touchdowns and 265 yards. For the defensive, Fingar secured 25 tackles and an interception. Riley Brittingham added nine tackles and one sack. Jack Peterson tackled eight players, with four sacks, while Damien Snyder also had eight tackles. The Mustangs' boys varsity soccer team topped Midlakes, 3-2, Thursday, Aug. 30. Tyler Griffin scored the game-winning goal for Penn Yan. Penn Yan lost to Bath, Tuesday, Aug. 28, in an away game. The final score was 9-0. Bath scored eight points in the first half. Penn Yan's varsity golf team fell to Geneva, 206-244, Friday, Aug. 31. Clayton Koivuniemi led with a low of 48. Peter Nicholson, Max Brodmann, Kevin Smith, and Cameron Bassage each had a 49. The Penn Yan golf team beat Wayne, Tuesday, Aug. 28, in a close match, 233-234. Koivuneimi posted a 43, followed by Nicholson with a 44. Brodmann added a 47. Bassage earned a 48 and Smith recorded a 51. The Mustangs topped Newark, Monday, Aug. 27. The final score was 228-285. Nicholson led with a 39. Smith had a 43, while Brodmann posted a 44 and Bassage had a 49. Zach Gurba and Clark Simmons both recorded a 53. The Penn Yan varsity tennis team beat Mynderse 4-1, Thursday, Aug. 30. Molly Pullen topped Sarah Kohberger, 6-3, 6-4. Claire Pullen beat Madison Lynch,6-2, 6-2. Sam Denson defeated Lily Redding,6-4, 6-4. In doubles, Abby Garvey and Sydney Moravec won against Alaina Wilkerson and Lacey Maloney, 6-3, 7-5. The Mustangs' tennis team blanked Midlakes, Monday, Aug. 27. The final score was 4-0. Neither team had enough players for a second doubles match. Molly Pullen defeated Suellen Petarcchi, 6-0, 6-0. Claire Pullen beat Jennifer Petarcchi, 6-0, 6-0. Denson topped Grace Payne, 6-0, 6-0. Garvey and Moravec won by forfeit 6-0, 6-0. The Lady Mustangs blanked North Rose-Wolcott, 3-0, Thursday, Aug. 30. Hayley Andersen, Leah Moniot, and Sierra Harrison each scored once. Harrison and Andersen also both assisted once. In goal, Elle Harrison had four saves. Penn Yan opened the season with a 1-0 win against Marcus Whitman, Tuesday, Aug. 28. Moniot scored in the second half. Harrison posted seven saves in goal. The Penn Yan varsity volleyball team lost to Hammondsport, 3-2, Tuesday, Aug. 28. The Mustangs won the first game before losing two to the Lakers. Penn Yan then won again, but Hammondsport took the last game, 26-24. Caitlin Wunder earned 25 kills, 24 digs, and three aces. Serina Sheradin added 34 assists and seven aces. Akiya Brewer had 39 digs. DANSVILLE--The Dundee varsity football team lost to Dansville in an away game, Friday, Aug. 31. The final score was 18-14. Austin Brace rushed 125 yards on 11 carries and had one reception for 70 yards and a touchdown. Preston Cratsley rushed 38 yards on eight carries, with one touchdown. He also passed for 96 yards and had one touchdown. Preston Cole had 19 yards on seven carries, while Kenneth Empson Jr. posted 17 yards on four carries. On the defense, Cole led with eight tackles and one sack. Cratsley had seven tackles, while Cameron Denmark and Brace each earned six tackles. The Lady Scots topped Hammondsport 3-1, in the opening of the fall season, Friday, Aug. 31. Haille Empson scored all three goals for Dundee. Cheyenne Cummings and Lauren Howell each assisted once. In goal, Karynna Rutledge had nine saves. PENN YAN--The Hammondsport varsity volleyball team won against Penn Yan, 3-2, Tuesday, Aug. 28. The final scores were, 23-25, 25-23, 25-23, 23-25, 26-24. Brianna Pratt had eight aces and 43 assists. Julia Bennett posted 21 kills and 12 digs. Shelby Sherman earned 10 kills and 10 digs. 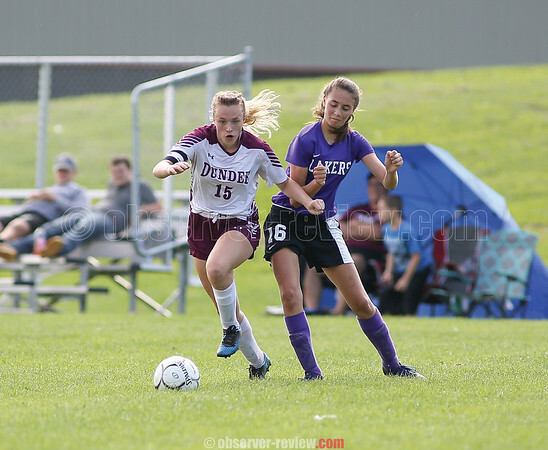 The Hammondsport girls varsity soccer team lost to Dundee in a home game, Friday, Aug. 31. The final score was 3-1. Individual statistics were not provided. The Lakers were beaten by Jasper-Troupsburg, 5-0, in the opening game of the season, Wednesday, Aug. 29. In goal, Megan Allen had eight saves for Hammondsport.